A project completed towards the end of 2017 was a second attempt to design a leaded panel to be back fitted into an old fire-screen. The Phoenix (see separate page) was framed instead and has graced a number of exhibitions. Currently in Aberfeldy Gallery offered for sale... The new design was inspired by a picture I took approximately 35 years ago on a visit to Sinai. 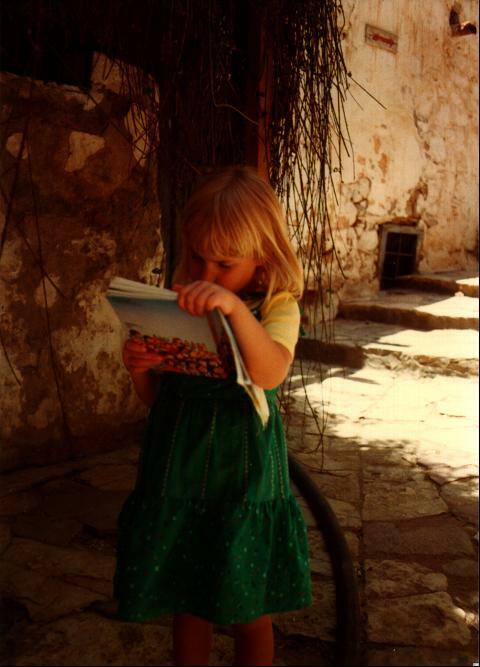 The picture shows my daughter reading her children's Bible, on a visit to St Catherine's Monastery, while studiously ignoring the bush behind her. This according to legend was the burning bush, out of which God spoke to Moses. The actual design was based on another picture of a tree that stands just outside our studio.